Sri Lanka's golden era in swimming in the South Asian region was during the ‘Julian Bolling-Dipika Chanmugam Era’ when the country won 13 Gold medals in the pool at the 1991 SAF Games held in Sri Lanka, where the island nation came out on top defeating powerful sports nations in the region, bagging 41 Gold Medals overall. The relay-quartet from Asian International School, Killer Whale Aquatics, who set five National Records in 200m Medley, 200m freestyle, 400m medley, 400m freestyle and 800m freestyle events. (from left) Salome Fernando, Machiko Raheem, Andrea Jelinek and National Champion Kimiko Raheem. During that historic 1991 SAF Games, country's ace swimmer, present coach, Julian Bolling won six Gold medals while his cousin Deepika Chanmugam won seven Golds. Since then, Sri Lanka hardly won many Gold medals in the pool. Through the recently concluded National Aquatic Championship, the country was able to find some ace swimmers, and is eager to show off talent on the South Asian stage with the emergence of Matthew Abeysinghe and Kimiko Raheem. 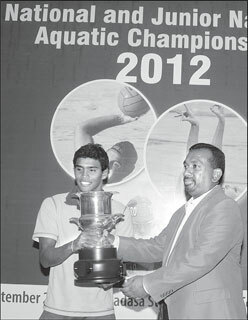 Precocious thirteen-year-old Raheem and Abeysinghe, who is at 16, were the cynosure of the 2012 National Swimming Championship, held at the reconstructed Sugathadasa international pool. Twenty-three National Records were set up at the renovated Sugathadasa pool after a lapse of three years. “It is a great thing to provide facilities for the next generation with this internationally standard swimming pool after a lapse of three years,” said Sports Minister Mahindananda Aluthgamage, at the reopening ceremony a fortnight ago. Kimiko betters three SAG records Kimiko Raheem set five national records during the National Games. Raheem erased the 200m backstroke National Record of 2.31.02 set by Dipika Chanmugam 22 years ago, on September 30, 1990 at the National Swimming Championship. In her 50m freestyle event, she recorded an impressive time of 27.55. It was for the first time in the history, that a Sri Lankan swimmer clocked under 28 seconds in 50m free, breaking the previous record of 28.48 set by Menaka de Silva on November 1, 2003. Raheem also bettered the SA Games record of 27.70 set by India's Lekha Kamath in 2006 SA Games in Sri Lanka. The Asian International School student aims at five Gold medals in the South Asian eight-nation games, which will be held in India next year (2013). It was special that Sri Lanka's 2012 London Olympian Reshika Udugampola was defeated by Raheem in the 50m butterfly event as she clocked 30.67.
ahead of unsung hero, Matthew's 20. Sri Lanka's only men's medal prospect are Heshan Unamboowa and Matthew Abeysinghe. Olympian Unamboowa could not compete in the National Championship as he is currently based in United States of America. Matthew Abeysinghe broke the 26-year-old National Record of 4.48.32 in the 400m Individual Medley set by country's ace swimmer Julian Bolling on September 25, 1986 in South Korea. 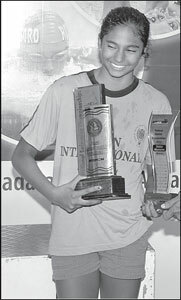 Abeysinghe is an all-round swimmer with world class potential though he is 16 years old. He set three National Records with 100m and 200m freestyle events. Abeysinghe's timing in those events are superior than the SA Games records as he clocked 52.09 and 1.53.19 in 100m and 200m frees and his best timing of 4.04.04 in the 400m freestyle is read ahead of SA Games record of 4.05.94. Machiko Raheem, from the swimming family of Raheem, broke three National Records in the 200m freestyle 2.11.98 and 400m free 4.43.89 and in 800m freestyle clocking 9.56.10. She bettered the South Asian Games 200m freestyle record of 2.12.37 set by India's Nisha Milet on December 1, 1999. Both Machiko and Kimiko are the sisters of Mayumi Raheem, who won three Gold medals in the 2006 eight-nation games held in Sri Lanka. Sixteen-year-old Machiko specializes in freestyle and she excelled in the relay events, where all the five women relay National Records was broken by swimming-quartet comprising of Kimiko Raheem, Salome Fernando and Andrea Jelinek from the Asian International School. Jelinek, who trained in the Killer Whale Aquatics, is a Sri Lankan-born Austrian swimmer. Out of 44 events, the swimmers, who trained at Killer Whale Aquatics won 20 Gold medals, 12 Silver medals, 11 Bronze medals with 16 National Records and bettered four SA Games records. 200m freestyle (1.56.01) Kimiko Raheem, Salome Fernando, Andrea Jelinek, Machiko Raheem. 200 Medley (2.08.72) Kimiko Raheem, Salome Fernando, Andrea Jelinek, Machiko Raheem. 400m freestyle (4.17.79) Kimiko Raheem, Salome Fernando, Andrea Jelinek, Machiko Raheem. 400m Medley (4.46.78) Kimiko Raheem, Salome Fernando, Andrea Jelinek, Machiko Raheem. 800m freestyle (9.38.43) Kimiko Raheem, Salome Fernando, Andrea Jelinek, Machiko Raheem.